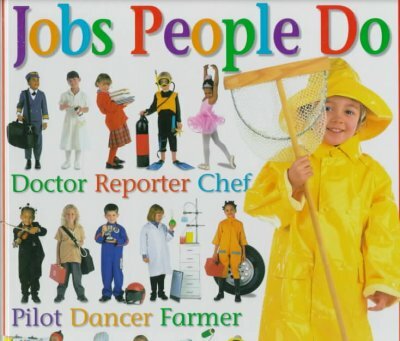 Yesterday we looked at the top ten challenged books for the year 2014. 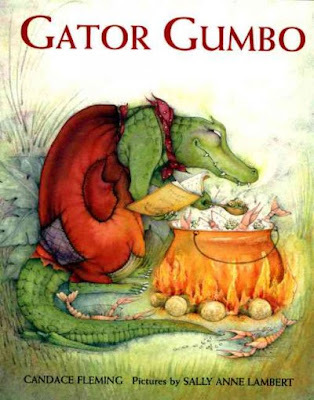 It seems that most challenged books these days are those deemed inappropriate, by their challengers, for young readers. Today, we're going to look at the "Top 10 Banned Books Of The 20th Century" as compiled by Read the Smiths: American Lifestyle Magazine. These books are all novels that were written for adults. How many have you read? It's "Banned Books Week," which is an annual celebration of libraries, publishers, booksellers, and individuals of our right to read whatever we want to read! Think of it as an extension of our right to free speech. Few books are actually "banned," but quite a number are challenged each year in an attempt to ban them. Here's the American Library Association's list of the "Top Ten Frequently Challenged Books of 2014." How many have you read? Saga, by Brian Vaughan and Fiona Staples. To learn more about the ALA's lists of challenged books, click here. On the 27th day of the 10th moon in the 22nd year of Kuke Hsiang of Lu the teacher-philosopher, Confucius was born. That would be September 28, 551 BCE. When I was a child, fortune cookies often came with one of Confucius's sayings. An example is, "What you do not want done to yourself, do not do to others," which is a variation on the "golden rule." Another is, "Benevolence is the characteristic element of humanity." Confucianism is a semi-religious group of those who follow the teachings of Confucius, but do not worship him as a god. To learn more, read Confucianism by Louise Chipley Slavicek [181 SLA]. To find out more about the life of Confucius we have two books in our children's section, Confucius: The Golden Rule by Russell Freedman [J B CON] and Confucius by Russell Roberts [J B CON]. KK Has Left the Building! Taking a short break and will be back to posting next Monday, September 28. 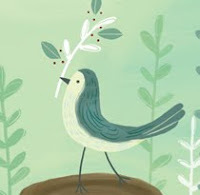 Clearly, there are a lot of bird poems flying around out there, and many of them can be found perched on the branches of anthologies. But this assemblage offers a fresh approach. By matching a rich set of poems about birds with illustrations by the illustrious David Allen Sibley, we have provided the reader in one volume with pleasures that are literary, pictorial, and scientific. their yellow-circled pupils bright and cold. parting Sunday's gray air like a spear. turned back to what I was. Michelle is hosting the Poetry Friday Round-Up at Today's Little Ditty. Last week, a new science video series began--"Science With Tom." Here's the first of the video, which has to do with the question, "What is life?" Next week is the official start of Fall and with it comes cooler weather. And when I think of cool weather, there's nothing I like better than a good bowl of soup. Borrow one of our gazillion soup cookbooks now to plan out the next three month's worth of tummy-warming meals! You'll find them in the 641.813 section. For those of you who are movie fans, here are some of the films we added to our adult collection the months of June through August. The titles reflect films just released on DVD, classics, or those we have had to replace due to loss or damage. If there is a film you think we should have in our collection, please let us know by filling out a "Request for Purchase" form online or at the library. Let's Have Our Own Cute-Off! Biologists and other natural scientists recently held a "cute-off" on Twitter where they posted photos of cute animals and tagged them with #CuteOff. Interested? Go to Twitter and put in the #CuteOff hashtag, or, read at it here. If you don't have time to go through them all, here's a nice collection of contenders. In case you're interested, the New Hampshire Poetry Festival is being held next Saturday, the 19th, at NH Institute of Art in Manchester. Be sure to sign up before it's too late! 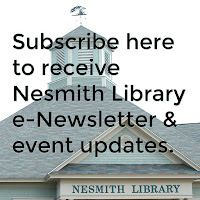 There will be plenty of poetry readings at the festival--from notables such as Charles Simic, to locally published poets, to unknowns at the open mic session in the evening. 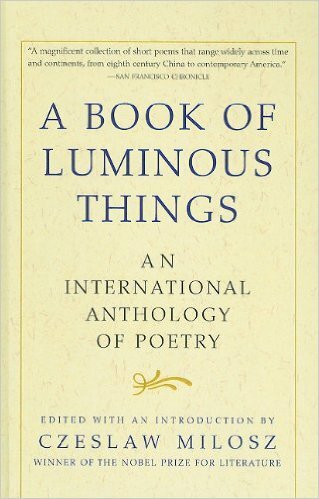 For today, I have a poem found in A Book of Luminous Things: An International Anthology of Poetry edited by Czelsaw Milosz [808.81 BOO]. 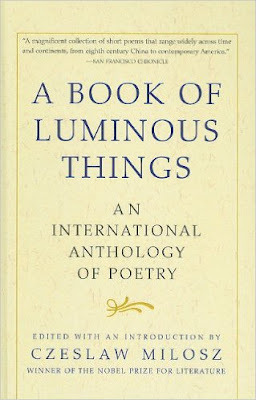 By Polish poet, Anna Swir, the poem is titled, "Poetry Reading" and is translated by Czeslaw Milosc and Leonard Nathan. With fame comes the expectations of those who are not famous. Expectations that the famed person may not be ready to meet! Head down to South Carolina where Robyn is hosting the Poetry Friday Round-Up at Life on the Deckle Edge. Although Bob Ross passed away 20 years ago, many people fondly remember his show on public television, The Joy of Painting. Ross had a soft, rather hypnotic voice. His belief that anyone can paint was contagious. Within the past week, an old Joy of Painting segment, "Shades of Grey," has resurfaced on Facebook, and is now available on YouTube. The amazing thing about this video is that it shows that color blindness need not hold one back. Watch! This is going to be a short post today. The video says more than enough, I think. Compare the video to the interactive map published by National Geographic in 2013. If you want to read up more on the subject, look for High Tide: The Truth about Our Climate Crisis by Mark Lynas [363.738 LYN] or The Encyclopedia of Global Warming Science and Technology by Bruce Johansen [577.276 JOH]. In our collection we have a number of picture books by New Hampshire author, Tracy Kane, all JP KAN: Fairy Boat, Fairy Flights, Fairy Houses, Fairy Houses--Everywhere!, and The Magic of Color. Another book, Fairy Houses--Unbelievable! is found in the adult section [745.584 KAN], for adults to use as inspiration for building their own fairy houses. 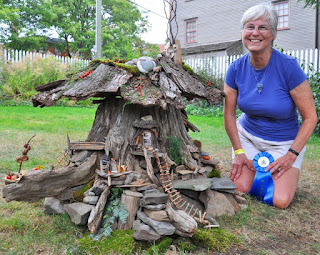 A "winning" fairy house from 2014, courtesy Fairy Houses. 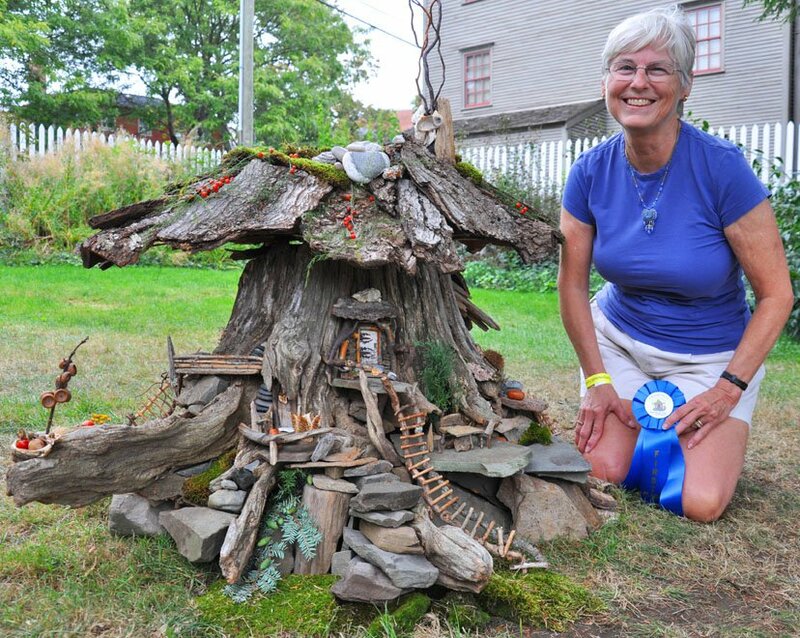 The last weekend of the month, September 26-27, there is a "Tour of Fairy Houses in Portsmouth, NH 2015." This is the 11th year the tour is taking place. Mark it on your calendar now--it's sure to be a big hit with the children in your life. To learn more, click here. To recreate the fairy house experience in your own home or yard, also look for the Fairy Garden Handbook by Liza Gardner Walsh [635.083 WAL, also ebook] or Fairy Gardening: Creating Your Own Magical Miniature Garden by Julie Bawden-Davis [ebook]. We also a book for kids, Super Simple Fairy Gardens: A Kid's Guide to Gardening on order--look for it to arrive soon! It's Labor Day today, and the Library is closed. We will reopen tomorrow at 9:00 AM. We honor all work today, and express our appreciation for the workers who keep our community, and our world, running. In Melbourne, Australia, the city assigned ID numbers to trees in its public parks. The trees were also given email addresses so that citizens could report tree damage. The result is that the city began to receive messages of appreciation for the trees--essentially love letters. It’s a dynamic that is playing out more broadly, too, in concert with a profound shift toward the ubiquity of interactive, cloud-connected technologies. Modern tools for communicating, publishing, and networking aren't just for connecting to other humans, but end up establishing relationships between people and anthropomorphized non-human objects, too. The above quote is from an article found in July on The Atlantic magazine website. Of course, when thinking of love letters to trees, it's hard not to think of Joyce Kilmer's poem, "Trees," which had been around for a hundred and two years, having first appeared in Poetry Magazine in August 1913. 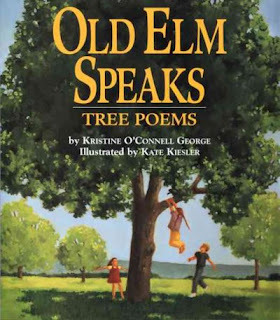 In our children's room, we have two books that are devoted to poems about trees, Old Elm Speaks: Tree Poems by Kristine O'Connell George [J 811 GEO] and Poetrees by Douglas Florian [J 811.54 FLO]. 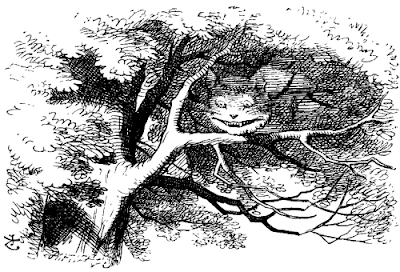 Start the Labor Day weekend right by stopping by Teacher Dance for the Poetry Friday Round-Up, and then go out and love some trees! Got a feeling that nothing you will do will make your cat happy? Psycho Kitty? : Understanding Your Cat's "Crazy" Behavior by Pam Johnson-Bennett [636.8 JOH] may help you to adjust your cat-owner-attitude! One more piece of advice. If you can't make your cat happy, you can at least make yourself happy. If the spirit moves you, give your cat a kiss. I also recommend The New Yorker Book of Cat Cartoons [741.5 NEW], or, spending the afternoon watching cat videos on YouTube. "National Rice Month" sponsored by USA Rice Federation, which is a "global advocate for all segments of the U.S. rice industry with a mission to promote and protect the interests of producers, millers, merchants and allied businesses." This year is the 25th anniversary of the rice month celebration. ThinkRice.com provides nutrition information and recipes, if you need a reason to eat rice. The Library has two books in its cookbook collection devoted to rice recipes: The Top One Hundred Italian Rice Dishes: Including Over 50 Risotto Recipes by Diane Seed [641.5945 SEE] and Seductions of Rice: A Cookbook by Jeffrey Alford [641.6318 ALF]. Rice is a major food crop for the people of the world in general and Asians in particular; nearly 90% of the world's rice is produced and consumed in this region. Furthermore, rice is a staple food for nearly 2.4 billion people in Asia, and except for Pakistan and some parts of India and China, rice provides two thirds of the calories for most Asians with rice-based diets. 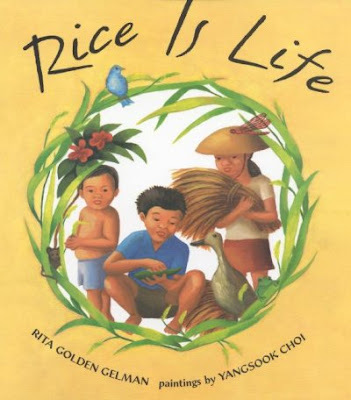 Rice Is Life by Rita Goldman Gelman [JP GEL] explains to kids how people in Bali subsist on a diet that is almost exclusively rice. Not like the typical American diet! Rice is universally cooked and served around the world, and Everybody Cooks Rice by Norah Dooley [JP DOO] explains how it is done and who does it. Celebrate the end of summer in more ways than by shopping for school! September is "National Chicken Month"! Have you noticed an increase in the number of people in town who are raising chickens in their back yard? 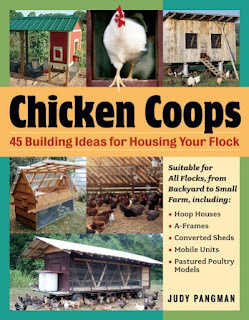 At the Library we've noticed it through the number of book requests we've received for books on chicken care. Enjoy "National Chicken Month" and maybe next year at this time, you'll be bringing us a dozen eggs!